As the Mideast veers into chaos and right-wing leaders gain popularity in Europe, there are fears that the two-decade-old peace agreement between Ireland and the UK may also be threatened. Twenty years ago today, then-Irish Taoiseach (Prime Minister) Bertie Ahern and former British Prime Minister Tony Blair signed the “Good Friday” agreement that brought peace and economic opportunity to Northern Ireland. Today, Brexit confusion threatens that peace, communities’ essential services are endangered, and prosperity is at risk — outcomes no one wants. 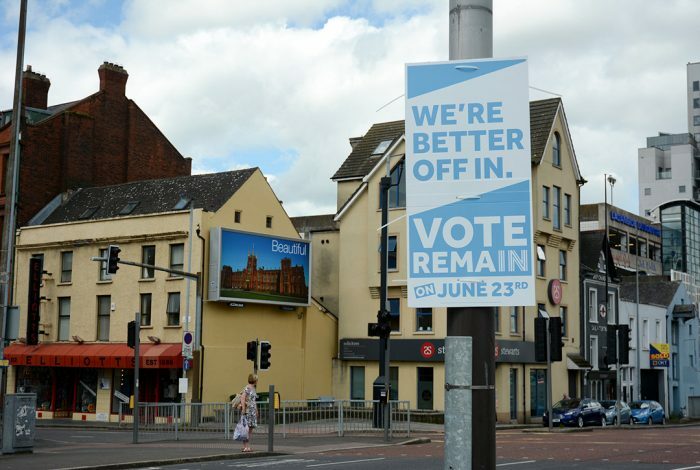 As WhoWhatWhy reported last year, the British referendum vote to leave the European Union has thrown Northern Ireland into turmoil — despite the region’s 56.8 percent vote to remain. A “soft border” refers to a border without checkpoints — as opposed to a “hard border,” which is a border with checkpoints on every road. Before the Good Friday agreement, the border area was patrolled by the British Army and the checkpoints were a constant source of conflict. Former New York Mayor Michael Bloomberg called Brexit the “stupidest thing any country has ever done” and said he wouldn’t have opened his business offices in the UK had he known it was on the cards. At a more grassroots level, A.J. O’Neill, spokesman for the pressure group Border Communities Against Brexit, which represents many people living along both sides of the border, said no one wants a return to any kind of physical border, hard or soft, between Northern Ireland and the Republic of Ireland to the south. “If any border goes up, the Good Friday Agreement goes out the door, and no one wants to see that as it’s working well in communities on both sides,” he told WhoWhatWhy. Cross-border industry is possible because the whole of Ireland is currently subject to European Union laws. Companies, including many American businesses trading in Ireland, will have problems when Brexit laws come into force in the north, as the goods they make will become subject to different laws and tariffs overnight. For example, a medical device company based in the south will not be able to use its usual Northern Irish haulage company and route to Europe via northern ports, as patent laws prohibit their devices travelling through a third country during export. “And there’s no way they’re going to be ready for these changes in 12 months’ time [when Brexit takes effect],” said A.J. O’Neill. This loss of commerce will hit the North’s delicate economy, and propel the area into an economic depression similar to the one it suffered prior to the signing of the Good Friday Agreement 20 years ago. Mitchell has urged current leaders on all sides “to recognise what is at stake” and to “come up with reasonable and acceptable compromise” regarding the border, to ensure the viability of the Good Friday Agreement, and to keep the peace and prosperity all have enjoyed and want to keep. Ambassador O’Neill said that the Good Friday Agreement was not in jeopardy, and that events held around the anniversary today were not so much commemorating its signing as reaffirming its indispensability. He called it “the people’s agreement,” citing approval ratings of 71 percent among the population of the north and 94 percent in the south.